A screen or "pick" occurs when an offensive player attempts to block, or "screen", a defensive player away from the man he is guarding, thereby freeing up that offensive player for an open shot or pass. Setting good screens (or "picks") is a very important fundamental part of the game. It is often assumed that players will know how to do this, but like any other important fundamental, it must be taught correctly. Screens are most helpful in freeing up a teammate against a man-to-man defense, and in out-of-bounds plays, and there are often times when you want to screen a zone defense as well. Setting good picks are basic to most offensive plays. Oftentimes, it is the screener that gets open (after sealing the defender). So setting a screen is a good way to get yourself open for a pass and shot. The "pick and roll" is still one of the simplest plays, but when done correctly, one of the most difficult to defend. The Utah Jazz's John Stockton and Karl Malone were masters of the pick and roll. 1. The screener must make contact with (but not foul, hold or push) the defender that he/she is trying to block. If you do not make contact, and get up tight, the defender will simply slide around you. 2. Be strong. Get your feet wide and plant your feet solidly. Do not move your feet once you have established this position or you will get called for a "moving screen" (a foul). You must be stationary and not move with the defender, and you must not push the defender away. If a defender bumps into you and you are not stationary, you will probably be called for the foul. 3. Keep your arms tucked into your chest, not only to physically protect yourself, but also so the ref can see that you are not pushing with your hands, or grabbing or holding the defender. 4. The angle, or direction, of the pick and the timing of the pick are probably the most important, and most overlooked factors in setting a screen. You must have the correct angle, or position, when you set the pick. 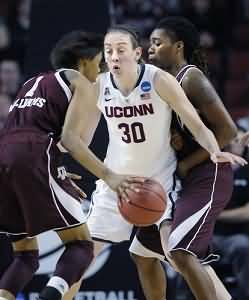 You must anticipate the direction that your offensive teammate wants to go, and then make contact with his defender in a position so that you are directly in the way of the defender, and he/she cannot get around you. If you don't get the right angle, the defender will simply slide around you. Perhaps this is best demonstrated in the diagram. In Diagram A, the screener does not make contact, and the defender slips behind. In Diagram B, the pick is too high ( a common mistake), and the defender slides behind the pick and stays with his/her man. In Diagram C, the pick is too low, and the defender can fight over the screen. 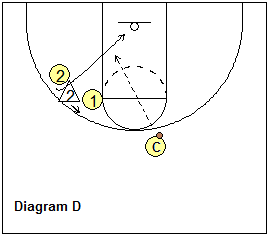 Diagram D shows a good pick, followed by screener "rolling" to the hoop. 5. After your teammate cuts around the screen, the screener "seals" off the screened defender and "rolls" (cuts) toward the hoop. If the defense switches the screen, often the "roller" will be open for the pass. 6. The timing of the offensive player receiving the pick. The player receiving the pick must be patient and wait for the screen from his teammate to arrive. Often, I will see a player make his cut just before the pick is "set", and the defender easily gets around it (because it never had a chance to be set). You must wait for the pick to be set, and then cut hard around it. Very importantly, this player also must "set up the screen" by making a step toward the hoop first, and then cut back over the screen. 7. The offensive player receiving the screen must cut hard, and close to the teammate setting the screen. You must "rub off" your teammate's screen... that is, brush against him as you go by. If you don't brush close to the screen, the defender can slip through the screen. 8. Remember, there are two options on the pick and roll play... pass either to the cutter, or if the defense switches, pass to the "roller". Screens can be on-ball (when set for the ball-handler), or off-ball. The screener is facing the defender that he is setting the screen on, often used in the open court, for the player with the ball. See diagram E. O3 sets pick for O1, the ball-handler. 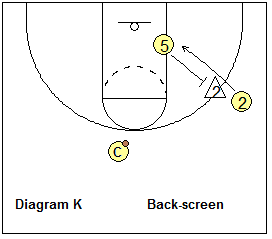 The screener sets the screen on the defender's "blind" side, or back side. Usually the screener is facing away from the basket. 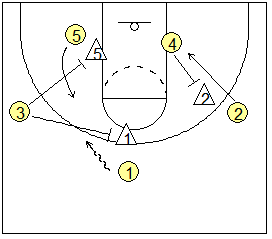 See diagram E. O4 sets back-screen for O2, who goes back-door to the hoop. 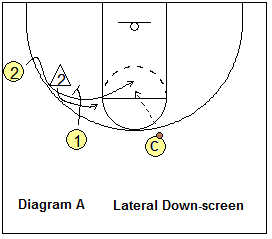 When setting the back-screen, the screener must allow a one-step gap between himself and the screened defender. The screener sets the screen usually down low for a player either near the block, or for another perimeter player "lower" or closer to the baseline (like in 4-out or 5-out offense). The screener is usually facing the basket with his back to the ball. When completing the "roll" move, he/she pivots facing the ball. 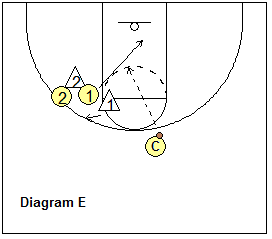 See diagram E. O3 sets down-screen for O5, who cuts outside for the pass from O1. The cross-screen can occur either on the perimeter with one guard cross-screening laterally, or sideways, for another perimeter player. Or one post player can screen away (cross-screen) for another post player. 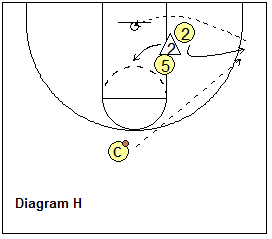 Looking at the diagram, if the cutter O3 basket-cuts, the screener pops out on the perimeter. If the cutter O3 cuts high on the 3-point arc, to O1's original spot at the top, the screener O1 should seal and slip the screen, looking for a quick pass from O2 on his/her cut to the basket. This is really a type of back-screen set on the perimeter wherein the screener screens the back-side of the defender (away from the ball), and the cutter "flares" to the open spot on the perimeter for the skip pass and 3-point shot. When setting a good screen, there are multiple options depending on how the defenders defend the cutter and screener. The diagrams below show all the options and we show a coach at the top with the ball, who passes to the cutter. You can use these as simple drills for teaching how to read the defender and and how to use the screen to your advantage. This is a down-screen set for a perimeter player. There are four options... curl, pop out, back-cut, and slip. The cutter and the screener must read the defense and choose the correct option. Curl over the screen. See diagram A. Here the defender chases over the screen, and O2 cuts hard over the screen for the pass and shot (diagram B). Cutter pops back and out. Diagram C shows the screened defender X2 stepping under the screen. O2 sees this, steps back and pops out to the arc for the pass and 3-point shot. Cutter back-cuts. Diagram D shows the screened defender X2 overplaying the cut, denying O2 and preventing him/her from going over the screen. O2 reads this and makes a quick back-cut to the hoop for the pass and lay-up. Screener slips the screen. 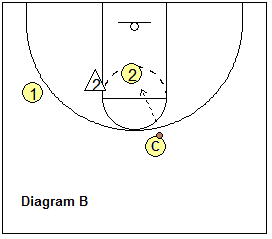 Diagram E shows the screener's defender X1 jumping out over the screen and overplaying the cut. 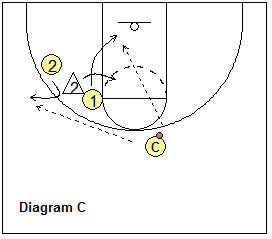 The screener O1 reads this, slips the screen, and makes a quick cut to the hoop for the pass and lay-up. 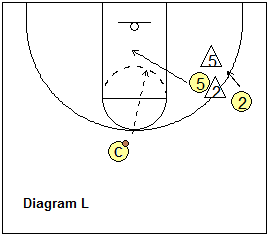 This is a down-screen set near the low block. Again, we have the same four options... curl, pop (or "flare"), back-cut, and slip. The cutter and the screener must read the defense and choose the correct option. 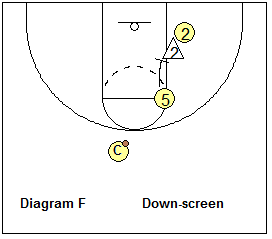 Diagram F shows the down-screen with our high-post player screening down for our shooter O2, and coach has the ball at the top. Curl over the screen. See diagram G. Here the defender chases over the screen, and O2 curl-cuts hard over the screen for the pass and shot. Cutter pops - flares toward the corner. Diagram H shows the screened defender X2 stepping under the screen. 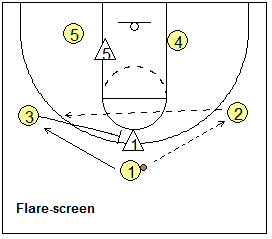 O2 sees this and pops out (flares) toward the corner for the pass and shot. Cutter back-cuts. Diagram I shows the screened defender X2 overplaying the cut, denying O2 and preventing him/her from going over the screen. O2 reads this and makes a quick back-cut for the pass and lay-up. Screener slips the screen. 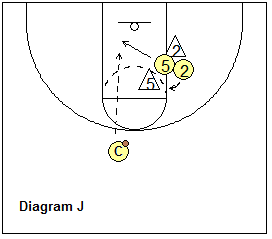 Diagram J shows the screener's defender X5 jumping out over the screen and overplaying the cutter O2. 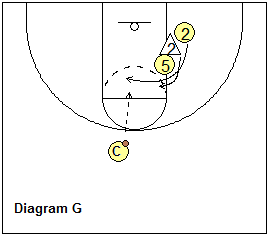 The screener O5 reads this, slips the screen, and makes a quick cut to the hoop for the pass and lay-up. Back-cut. Here O5 sets the back-screen for O2 (diagram K). 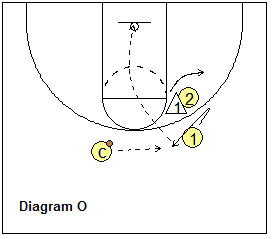 O2 back-cuts around the screen for a pass and lay-up. After screening, O5 pops out to the arc and could also get the pass. Slip option. If the X5 defender switches on O2, the screener O5 reads this, seals X2, and slips the screen for a pass inside and a lay-up. If nothing else, the back-screen is often a great way to get defensive mis-matches in the low post, or on the perimeter. 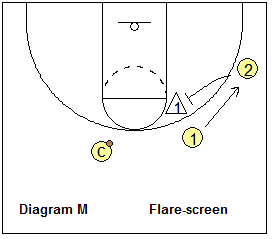 A flare-screen (diagram M) is really a back-screen set by one perimeter player for another with the cutter going away from the ball. Cutter goes over the screen. 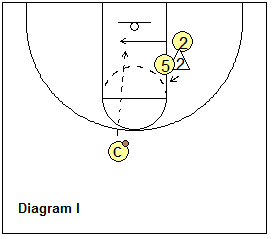 See diagram N. Here the defender is caught by the screen, and O2 cuts hard over the screen for the pass and 3-point shot. Cutter steps back and pops. Diagram O shows the screened defender X2 stepping under the screen. O2 sees this, steps back and pops out for the pass and shot. Screener slips the screen. 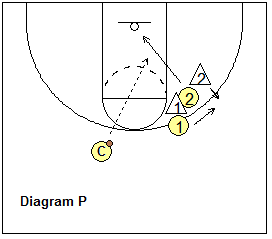 Diagram P shows the screener's defender X2 jumping out over the screen and overplaying the cutter O2. 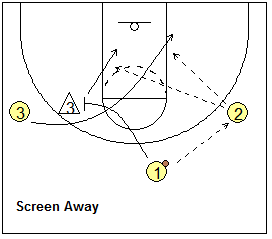 The screener O2 reads this, slips the screen, and makes a quick cut to the hoop for the pass and lay-up.